My birthing day progressed perfectly and in a way where I felt in complete control using my Hypnobabies techniques. In my Visualizing Your Birth sessions I had imagined my birthing beginning in the early morning hours after a full night of sleep and our baby being born as the sun set just like my ideal Special Safe Place setting. The power of the mind and Hypnobabies sure is an amazing thing! It all started out on a Saturday night. I went back to my parents’ house so I could get a home cooked meal and sleep in. To be honest, I just really didn’t want to parent a 22 month old Lucy solo at 39 weeks pregnant and my husband, Colin, was going to be doing construction on the basement all weekend. I had been listening to my Hypnobabies tracks nightly and loved the “Visualize Your Birth” and “Hypnotic Childbirth 2” the best. As one of the first people to go through the Online Hypnobabies class, I was feeling prepared but knew that I wasn’t the perfect student. 5:00 am: Sunday morning I woke up to Braxton Hicks waves. I had been having them every morning from 3 to 5 AM for the last several days so I didn’t think much of it. When Lucy woke up at 6:30 they were still pretty consistent so I went out to hang out with her and my mom. After about an hour they hadn’t slowed down so I quietly downloaded a timer and soon found out that they were every 5 minutes for about 45 seconds each. Since my birth with Lucy lasted over 50 hours, I was hesitant to say anything in fear that this wasn’t the real deal. However, I still had to drive 45 minutes in order to get home. I made the decision to head back and my parents gladly kept Lucy. 8:30 am: I called Colin but he didn’t pick up! Our only rule for the last couple of weeks was if I called I was in my birthing time, otherwise I would text. I understood he was working on the basement and with loud power tools he most likely just didn’t hear the call. Bubble of Peace in place, deep breaths Abby! I thought that sneezing was the most dangerous thing you could do while driving but it turns out that having waves while driving is far more risky! Luckily I was able to breathe through them with my Peeeeeace cue and focus on getting home and the car ride went very quickly. Colin finally called back with the raspy voice “Hello? Why are you heading back so soon? We haven’t started yet this morning.” I quickly realized he was hungover from a late night out with his dad the night before. This rarely ever happens! When I told him I had been having consistent waves the only words he could muster were “Not. Today.” Oh boy, this was going to be interesting. 9:30 am: When I got home I grabbed my birthing ball, some snacks, a few bottles of water, and went into our master bedroom. I knew that I wanted to be alone so I could focus and figure out if this was the real deal. My favorite tracks during practice were Hypnotic Childbirth 2 and Visualize Your Birth so I went back and forth between these two. I loved going through the visualization and it was evident that my birthing day was already following the storyline that I had imagined and pictured in the weeks leading up to this event. So cool how our minds can create reality through Hypnobabies! Colin was so sweet and kept coming to check in on me and massage my back as I breathed through the waves. They increased to about a minute each but stayed right around 5 minutes apart which was manageable but also helped me realize that we were most likely going to have a baby today. Our baby! A whole week early and coming right before the biggest construction week of our entire basement remodel project, but we were going to meet our baby. 1:30 pm: I birthed like this for 4 hours but honestly it felt like less than an hour of time had passed just like the Hypnobabies tracks had prompted. I used a hot shower for some pressure relief and moving through the waves on my birthing ball or with yoga helped maintain my focus. My DoTERRA Peace blend put me instantly at ease and the Clary Sage and Jasmine oils rubbed on my ankles and abdomen helped intensify my waves when I felt like they were starting to wear off. I knew from my birthing day with Lucy that I wanted my waves to stay powerful and frequent and wanted to meet this baby as soon as my body would let me. At 1:30 Colin came up and said his projects were done and within minutes I could feel my waves picking up to every 3.5-4 minutes apart and well over a minute each. I felt a peaceful rush fall over me knowing that I was safe and that my husband was going to be there to support me from here on out. 2:00 pm: We finished packing up our last minute items and headed to the hospital. It was over a 20 minute drive but my body let me relax and my waves lost their intensity during the drive which was a great break. I started listening to my Hypnobabies track “Easy First Stage” and instantly fell in love with it. This is such a great track to listen to for the first time on your birthing day and the new inspiration caught my attention and held it. I wanted the car ride to last forever just so I could be alone with this track and in the serene focus and beautiful feelings that it brought to me. 2:30pm: One of my favorite midwives, Phoebe, was on call that day. She checked my cervix and I was at 4 cm. Of course I wanted to be a full 10 cm but I never got past 2 cm with Lucy until hour 50 so this was already progress. I pulled in my Peace cue while I asked her to sweep my membranes and in the process, my water broke. There was no going back now! 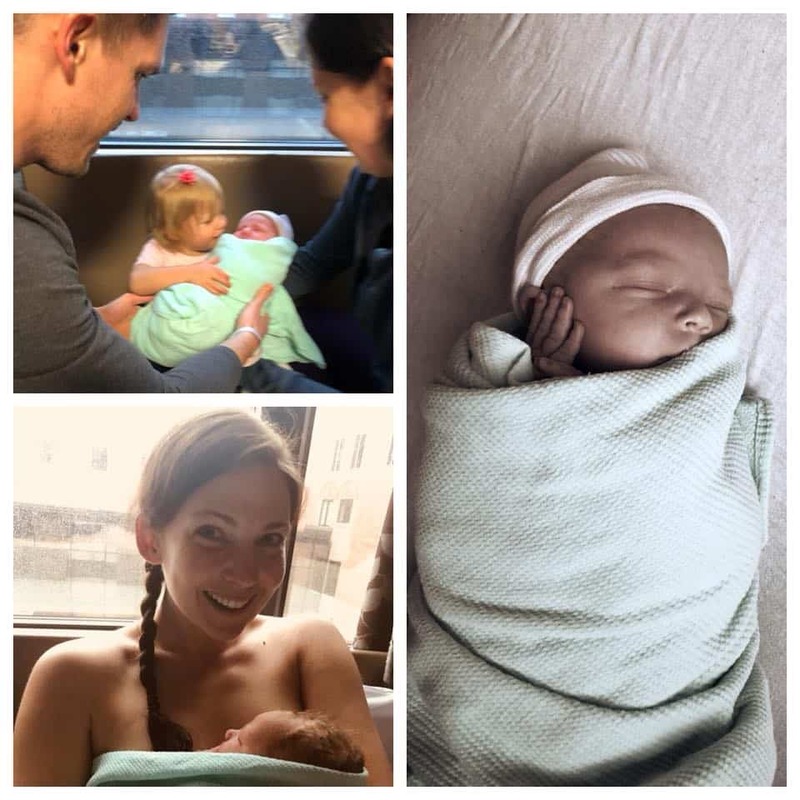 There was meconium in the water so they quietly explained that I would not be able to have my ideal water birth and that I would be hooked up to monitoring during the process. I pulled up my Bubble of Peace and didn’t let these words phase me. My husband was in awe that I was able to be so positive with such a big change of plans but my BOP was the super hero during this part of the events. With BOP, nothing negative could touch me and our birthing day. 3:30 pm: After a decent amount of time of monitoring in triage, we left to head to our beautiful birthing suite. Phoebe and Colin took turns massaging my lower back during waves and applying counter pressure to my hips and everything was still manageable. With Lucy being sunny side up, she never was able to dilate my cervix so I only had back pressure and no sensations anywhere else. It was so cool to feel this baby’s head pressing down on my lower abdomen and I could tell that there was progress being made. 4:30 pm: Even though I couldn’t give birth to our baby in the water, Phoebe still filled the tub and let me use it for relaxation and pressure relief. I also began playing “Birthing Day Affirmations” out loud to set a positive mood for us all. I repeated the ones out loud that spoke to my heart and repeating them helped me truly believe how safe and comfortable I was. It felt amazing! Almost a little too good. The intensity of the waves simmered down a little bit and it gave me the break that I needed to power through transformation. 5:00 pm: Phoebe mentioned that if I wanted to speed things up, I could do a deep squat in between waves. If I really wanted to get things going, I could squat during the waves but that would be a lot of pressure and get intense really quick. Yep! Sign me up! At this point I still felt super in control and nothing had been too much for my body to handle. I was really ready to meet our baby and the boost from the Birthing Day Affirmations was creating the most empowering feeling throughout my entire body and mind. 5:15 pm: Well my midwife wasn’t lying! After a couple of rounds of constant deep squats I was barely getting any break between waves and they were lasting between 1.5-2 minutes each. I would stand up to stretch quick between waves then get right back down as I felt the pressure building. My husband used the Relax cue on my shoulder and his touch brought instant relief to my entire being. We hadn’t practiced this much, but memories from the few times we had came into focus during this trying time. It’s amazing how the Hypnobabies cues can truly brighten right when you need them most! I felt a sudden urge to leave the water birthing room and noticed Phoebe grabbed her gloves from her packet. I assured her that I wasn’t anywhere near ready to have our baby (remember that 50+ hour first labor) and she politely nodded with a smile “uh huh, okay… but just in case”. I instinctively went to my hospital bag and grab out a blend of peppermint and wild orange to help with an energy boost. I felt a lift immediately and my batteries were recharged. With the very next wave I felt the sudden urge to push. My midwife had been right! My husband switched to playing the Pushing Baby Out track on the speaker but I’m not sure if I recall many of the prompts with how smoothly things went from here. Phoebe asked if I wanted to get onto the bed but I felt the most comfortable standing at the foot of it as I beared down. It only took a couple waves before she asked me if I wanted to feel our baby’s head. Wow, we were really going to do this and like, now. Colin would later tell me that this is when several members of the hospital staff had entered the room but I was completely in the zone and only felt the support of my husband, midwife, Hypnobabies techniques and nothing else mattered. 5:30 pm: With my Mother Directed Pushing, I knew that I wanted to push the head out in between waves to avoid tearing. I was able to successfully do this and felt so in control of all of my body’s movements during this process. Focusing on the ring of bright orange hypno-anesthesia paving the way for our baby to crown made this part easier than I pictured. It was the coolest feeling of relief knowing that the hardest part of the actual pushing stage was behind us. With the next wave the rest of that tiny baby body came out and Phoebe caught him below me as I was still standing. 5:37 pm: Our baby was born! I pulled baby onto my chest and embraced with all the love I had. I could’ve held him forever with euphoria I was in! However, within five seconds Phoebe and the nurses were instructing my husband to cut the cord, and our baby was whisked away from us immediately. Baby wasn’t breathing. With an umbilical cord dangling between my legs I felt like I couldn’t move so Colin ran over to watch the medical staff do their thing. My midwife asked if I wanted to rest on the bed so I easily hopped up and anxiously waited for that sweet cry. Colin watched them stick a tube down his throat and rub him vigorously and after the longest minute ever we heard that tiny baby shout. Oh that noise was so precious! Colin came back and announced “we have a son” as tears filled his eyes. “Shut up” was all I could say “no way!” I was certain we’d be an all girl family despite everyone feeling confident there was a little boy in there. We had done it. A natural birthing day where I felt in control the entire time. There was never a time where I felt the need for pain medication and my body honestly took over and amped up its natural painkillers with every intensity boost those waves brought. 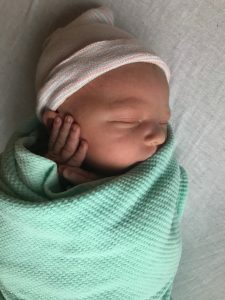 Yes there were times where I felt like that moment would never end but it was super helpful that the Hypnobabies course kept reminding me that this was all normal and these feelings were part of the process to get to meet our baby sooner. 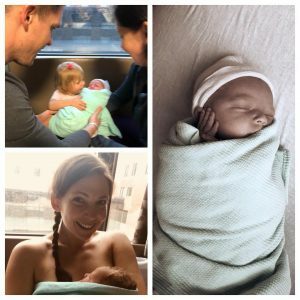 Your tracks are golden and will pave the way to the euphoric, empowering, redeeming, and fairy-tale birth story you will be proud to tell over and over again. Micah James Green, welcome to our world!